A team of researchers lead by Ignasi Ribas (Institut de Ciencies de l’Espai en Espagne) has discovered a potential super-Earth exoplanet around Barnard’s Star, possibly making it the second closest exoplanet to our Solar System. Barnard’s Star and its candidate planet make up the second closest system to our own Solar System. Credit: IEEC/Science-Wave – Guillem Ramisa. 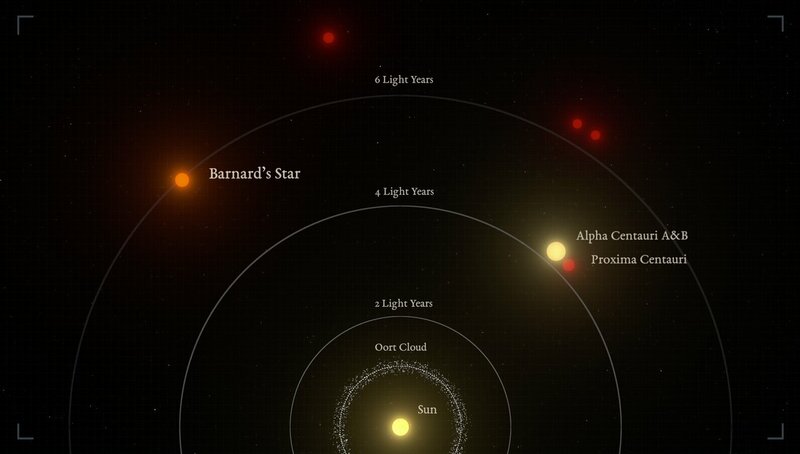 Barnard’s Star is the closest single star system to our Sun at a distance of 5.96 lightyears. Only the triple Alpha Centauri system (containing three stars) is closer at 4.37 lightyears. Barnard’s Star is an M-dwarf, which is a star much smaller and dimmer than the Sun. Its mass is approximately one sixth the mass of the Sun and its brightness is only 3% that of the Sun. Barnard’s Star’s apparent motion in our sky, also called proper motion, is the largest of all stars. It moves the width of the Full Moon every 180 years. Researchers have been interested in Barnard’s Star for a very long time, and the notion it may have a planetary system has been presented before. Peter van Kamp proposed the presence of multiple Jupiter-type planets orbiting the star in 1963. None of these were ever confirmed, however. A super-Earth in Barnard’s Star’s system? By putting together observations collected over nearly 20 years using instruments such as CARMENES (Calar Alto high-Resolution search for M dwarfs with Exoearths with Near-infrared and optical Échelle Spectrographs) and HARPS (High Accuracy Radial velocity Planet Searcher), a signal was identified using the radial velocity method. This signal could correspond to an exoplanet with a period of 233 days and a mass of at least 3.22 Earth masses. This limit placed on the mass of the planet would make it a super-Earth, a planet with a mass between that of Earth’s and that of Neptune’s. If it exists, this planet would also be quite cold as it would be orbiting near the system’s ice line where a planet’s volatile components may start to condensate. The planet’s surface would have a temperature of -170°C which would make it unlikely to harbour life. 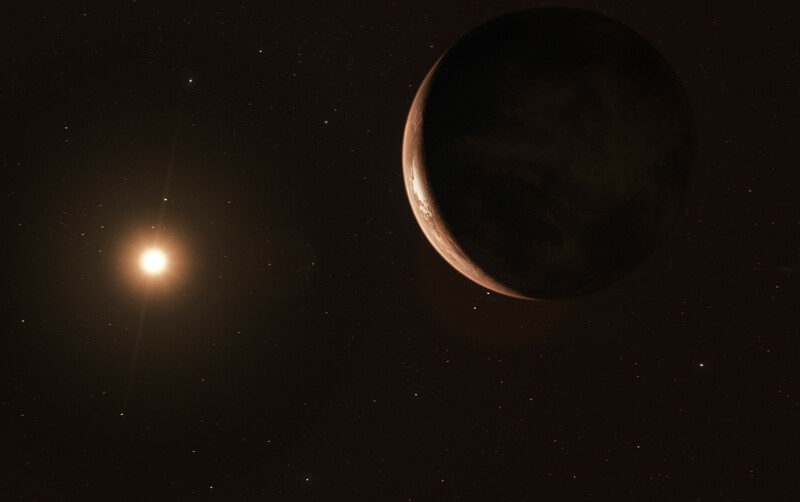 An artistic representation of Barnard’s Star (left) and its planet (right) as seen from space. Credit: ESO/M. Kornmesser. This potential super-Earth is only a candidate for the time being. More observations are needed to confirm the nature of the signal found in the radial velocity data. Performing astrometry using Gaia data could allow scientists to measure the effects of a planet on its star which would allow us to confirm the exoplanet’s existence in the next few years. It may also be possible to eventually directly image the exoplanet using the next generation of large telescopes which will become operational in the near future. If this planet is confirmed, it will earn the title of the second closest exoplanet to our own Solar System, after the exoplanet orbiting Proxima Centauri.